FILE - Cars for export stand in a parking area at a shipping terminal in the harbor of the northern German town of Bremerhaven, Oct. 8, 2012. European Commission President Jean-Claude Juncker will visit U.S. President Donald Trump in Washington on July 25 to discuss strained trade ties. 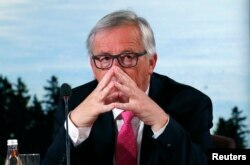 "President Juncker and President Trump will focus on improving transatlantic trade and forging a stronger economic partnership," the Commission said in a statement on Tuesday that announced the date. FILE - European Commission President Jean-Claude Juncker attends the G-7 summit in the Charlevoix city of La Malbaie, Quebec, Canada, June 9, 2018. "The European Union makes it impossible for our farmers and workers and companies to do business in Europe (U.S. has a $151 billion trade deficit), and then they want us to happily defend them through NATO, and nicely pay for it. Just doesn't work!" EU officials have been trying to lower expectations over what Juncker and Trade Commissioner Cecilia Malmstrom can achieve in Washington, noting Trump's rejection of many European arguments at last month's G-7 summit in Canada. "If we can instill some second thoughts even, that would be a success," an EU official said. "Is he really comfortable launching a $100-billion trade war over cars?"